I happily recommend Dr. Verma. I can't say enough good things about Dr. Verma. “My experience at Banyan Dental was wonderful right from the warm reception at the front desk to the final outcome. I can't say enough good things about Dr. Verma. He was personable, patient in answering all of my questions, very professional, and best of all, he made my teeth look as good as they possibly could and without hurting me. What more could anyone ask for?” – Stann H.
“Dr. Verma has a tremendousness attention to detail. My dental work was extensive and Dr. Verma did a fantastic job at every stage of process. I liked the fact that Dr. Verma was not only concerned with my dental health but he was focused on making sure I was well informed before each procedure and that I was comfortable and pain free during each visit. Dr. Verma has done an outstanding job in meeting my dental needs over the last several years. He is first and foremost concerned about me as a patient and has always worked with me to find the best solution in meeting my dental needs. He is caring and very knowledgeable. I highly recommend him to my friends and family.” – Kelly Z.
Dr. Verma is an artist! “I was raised by a dentist surgeon in Ontario and when I moved out to beautiful B.C. I tried about five different dentists for my oral hygiene. I was totally dissatisfied with the minor work I had done such as fillings, cleanings etc. I needed major work when I reached 50 years old and searched long and hard for the caliber of dentistry I was used to from my own father. Upon finding Dr. Verma through minor oral care needs, I instantly recognized his dedication to perfection and personal interest in his patients. I chose Dr. Verma to do the extensive work I needed as a result and have absolutely no regrets. If you require extensive dental work, you need not look any further. Dr. Verma is not only a high caliber dentist, he's an artist.” – S. H. Smith, Langley, B.C. “In searching for a good family dentist, Banyan Dental came highly recommended. Every time I walk into the clinic, I am reminded why. The first thing that I've always enjoyed is the warm reception; you're not a number here you're a patient and valued one at that. All of the staff treats you like that and each staff member makes you feel at ease, almost as if you're at home. Dr. Verma is not only a very good dentist, he has a warm and relaxing way that puts everyone at ease and puts the quality of care of his patients above all else. His attention to detail in the treatment of his patients is what sets his practice apart and provides a superior quality of service in the process. It can't be done right...it has to be done ‘exactly’ right...like an artist at work. 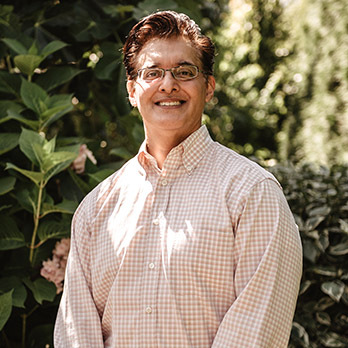 Dr. Verma is constantly looking to improve how he does his job with every member of my family. Whether it is our three boys, my husband, or I, everyone enjoys their visits with Dr. Verma. I would not, and have not, hesitated to refer friends/family to Dr. Verma because we have such a positive ongoing relationship with him.” – Lise O.